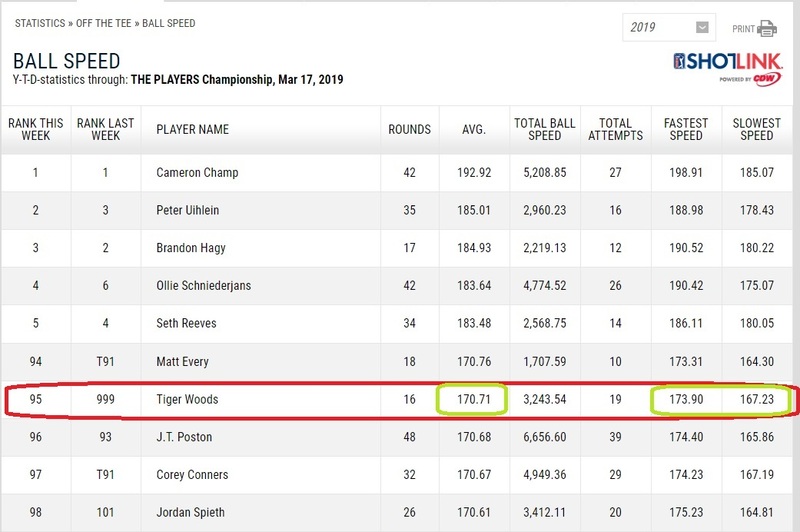 As you can see above, TW was in the top 20 in ball speed average last season, averaging 178.23 mph with a high of 182.32 and a low of 170.88, which are pretty solid numbers for a golfer at any age. He’s actually averaging lower in speed average this season than his lowest recorded speed from last season and – even more noticeable – his top speed this year is nearly 10 mph slower than last year’s top number. 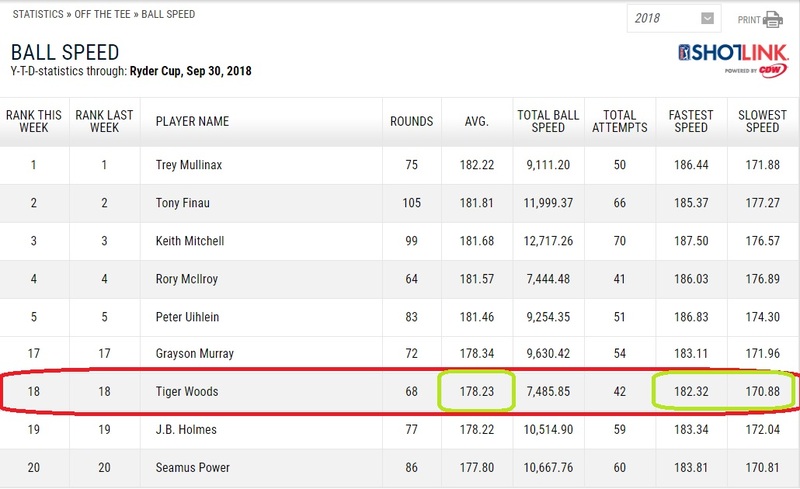 Now, he’s had a WD with a neck issue which he said was bothering him for a few weeks, so that could explain the drop-off, but I had noticed this ball speed decline nearly from his first event at the Hero World Challenge. He’s recorded nearly half (19 to 42) of the drives that determined his average last year, so the 5% decline can’t really be put down to rust, since he was recording 180+ numbers right from the start of his ’17-’18 campaign. So the question is, has something happened to him that we don’t know, beyond the neck issue, or is he simply swinging easier off the tee? Because if he’s swinging easier off the tee deliberately, that doesn’t explain how he’s had neck issues this season where he didn’t seem to, swinging a good deal harder last season. Could be nothing, but I thought I’d share something that’s been on my mind of late when I watch his numbers on television. I’d like to see him be competitive. I’d like to see him on the Champions Tour. I hate to say it, but I dont think we will see either. If we do see him on the CT, I have this feeling it will be painful to watch. needs to learn how to use that right hand and arm lever and he can get most of that loss back. i know his pivot needs work but i have seen guys who are not in the shape he is in, like Lee Comeaux, hit a ball with authority just firing the right side at the ball and hit it long. with his back issues, i don’t know if he will ever be able to pivot properly to maximize his power but there are a few things he can do to get some of it back. his swing looks so stiff and loopy. Which he is, but he’ll always go down in my book as the worst-swinging all-time great of them all, whomever is on the list. 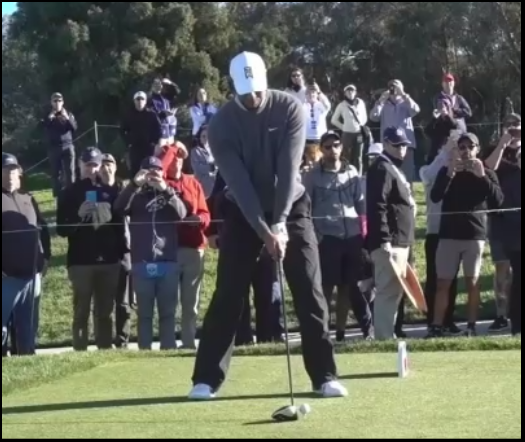 All he has to do is un-glue that leading foot and let the hips turn freely. It really isn’t rocket science, it’s simple fundamental basic mechanics, for Pete’s sake.